If you think you’re overwhelmed, spare a thought for Michael and Margaret Baudinet, the grateful-but-exhausted parents of FIVE bouncing babies! The babies were born in December, in Arizona, where the couple had temporarily located to be closer to specialists for this very special multiple birth. The now-famous “Bundle of Baudinets” – Ava, Clara, Camille, Luke and Isabelle – are the delightful result of persistence and a successful IVF procedure, after a series of fertility treatments. Margaret and Michael are not taking their hard-won babies for granted, although they admit it’s a steep learning curve! “I kiss five babies goodnight. I don’t know how to relate to a mom with one stroller. I don’t know what that feels like,” Margaret told Today. 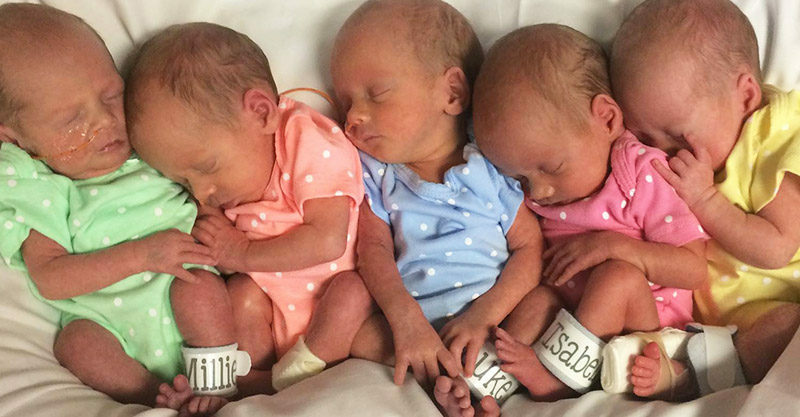 Born early at 32 weeks, weighing between 3 and 4 pounds each, the quintuplets are now 6 months old and thriving. So how do they do it, look after five adorable but demanding babies, without losing their minds? Schedule is the be all and end all, says Margaret, who refers to herself as the Lead Manager of Operation Baudinet. “We’ve got them all on the same schedule. We make them eat at the same time, which sometimes they don’t like, but it’s required. They sleep from 12:30 in the morning until about 7:30 in the morning,” Margaret said. The mum-of-FIVE-freaking-babies says sourcing products and equipment designed for multiple life also made a huge difference to parenting her many babies with less stress, although at the end of the day many human hands make light work. “There are a lot of things on the market now that make it easier to feed two at a time… chairs that you can put them in, ‘table for two.’ We have two of those,” Margaret told Today. “I don’t know what it’s like to diaper one bottom and put one baby to bed,” Margaret laughed. Michael said that with five babies in the house, they quickly realised they could not make things work unassisted. “You can’t be shy. This has forced us to be willing to ask people for help,” he revealed, saying the family work with two au pairs and a rotating army of ten volunteers to keep the wheels turning. The family have a Facebook page where they share glimpses of life with their quints. It’s proven to be an invaluable source of support and seen the family recognised far and wide, as well. It’s this heartening support – and those many, many cute little cheeks – that are seeing this family thrive… times five!